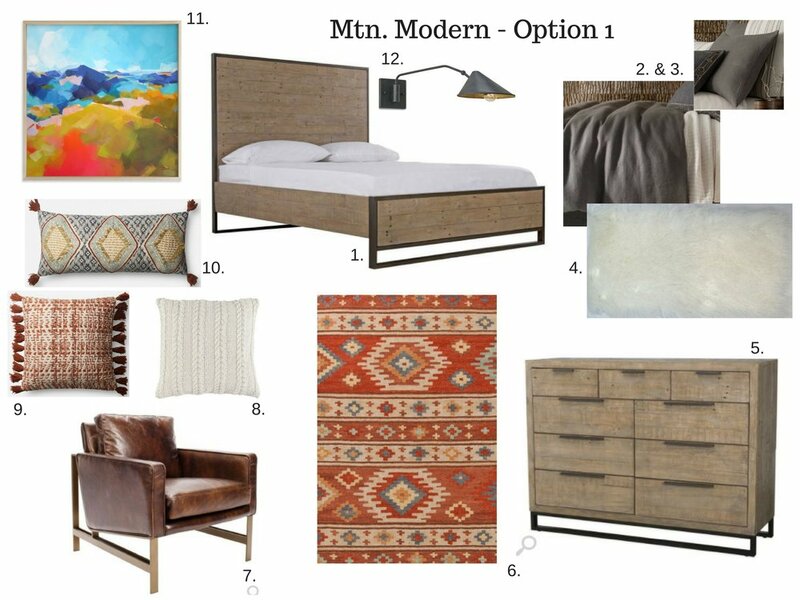 We live in such a beautiful area that we tend to want to bring the feel of cozy mountain cabin into our homes. As we move forward from the 1970’s cabin we can leave some of the old styles of the log furniture behind and upgrade it with a modern touch without losing that cozy curled up by the fire feeling. We have put together 3 different bedrooms. They all have the same bed and and bedding, a dark grey linen duvet cover and euros. We were able to get 3 different looks just by switching some of the accessories up. Take a look and let us know what your thoughts are. You have the lovely soft neutrals from the wood in the bed and the dresser. So it was fun to add pops of color in with the wool rug. Adding some dimension, the texture in the pillows is really fun. You have the neutral tones with some burst of color. We went with a leather chair with metal legs. The color of the leather helps bring some warmth to the room. I don’t know if you are like us, but anyway we can incorporate a sheepskin into the room helps add texture to the bed and it’s super soft. Or you can even use it as a rug and layer up on your other rugs. Sconces are always a nice touch because it gives you freedom to have a side table and not take up space with a lamp. We chose the metal sconce because of its shape and how it helps add some contrast with the neutral palette and pops of color. Finally, you need some art, we went with this bright abstract of a mountain because it’s not your typical “Here’s a mountain painting…” It helps tie in some of the color palette with the pillow and rugs. This palette is a little softer than the first option. We went with a really fun grayish rug. This rug has some serious texture though, the looped nubs feel fantastic on feet, it just really helps bring the soft palette together. The chair choice is a little more of a mid century modern design but the tone of the wood and the linen look of the fabric makes it feel comfortable. We added another sconce, similar to the first one but different in shape. We also added a fun lamp, that is sculptural, it has natural wavy lines that looks like you just found it out in nature. The pillows still add nice pops of color and have an abundance of textures, from wool to embroidery. Finally the painting is a little more literal of a mountain painting, but it’s loose lines and choice of color help give it an abstract feel. The final option is a very neutral palette. The rug is a greige and is a hand knotted wool and viscose rug, so it will feel amazing on your feet. We would also put the sheepskin into this room as well, again whether it’s for the bed or to layer on top of the other rug. We added 2 light fixtures into this room. The round drum shade is modern in its sleekness but is soft enough to help tie this whole look together. The sconce we used is a little more sculptural mixing wood and metal. The chair in this selection is a little bulkier in its design, I love that the frame you can really see the wood grain, like someone just cut the tree down and said here is a chair. The fabric is a textural pattern that ties in the greige scheme. The pillows are black and white with just a touch of color. But like the others, they are not lacking texture. Bringing textures in will help in any room. Finally, we chose a black and white photograph of some pine trees. Because no matter where you go in the Pacific Northwest you will always run into some pine trees. Let us know if you have any questions? If you are interested in any of the rugs or the art please don't hesitate and we would be happy to put together a quote together for you. Also, the soft goods will be available to purchase in our online store,for furniture inquiries please email us at emily@thenestdesignstudio.com.